This was my 5th year competing in the science fair, and was my second year in senior division. I placed first in my division and second overall. By getting second overall I was awarded for the second time in a row the opportunity to be an observer at the international science fair. I went last year as the observer in Pittsburgh, Pennsylvania. This year it was located in Phoenix, Arizona May 8th-13th. During that time I missed our all school exhibition, so I am doing a science fair page to make up for missing our all school exhibition. The goal of my project was to create an artificial muscle that could be used in robotics, prosthetics and wearable strength augmentation devices (exoskeletons). By making the artificial muscle out of fishing line, it’s more cost effective than traditional motors or servos. The design for the muscle needed to be reliable, cost effective, and strong. By creating this muscle, it can make prosthetics more accessible to the public and the cost can be much lower than a traditional prosthetic. Through testing the different fishing line weights, the best all-around muscle was found. There were a couple different methods of testing used. Those methods are weight testing (to break/melt) and to measure the flex distance to see how uniform the muscles functioned. The 30lb line was chosen to be used in the demonstration models due overall performance. The muscle made from 30lb line was stronger than the muscle made from 25lb line and could lift nearly as much weight as the muscle made from 50lb line but could flex 50% more than the 50lb line. This meant it was right in the middle with good strength and movement. This is how the muscle works. As you can see when cool the muscle is cool it is in its “original state” and when heated it contracts and becomes smaller. 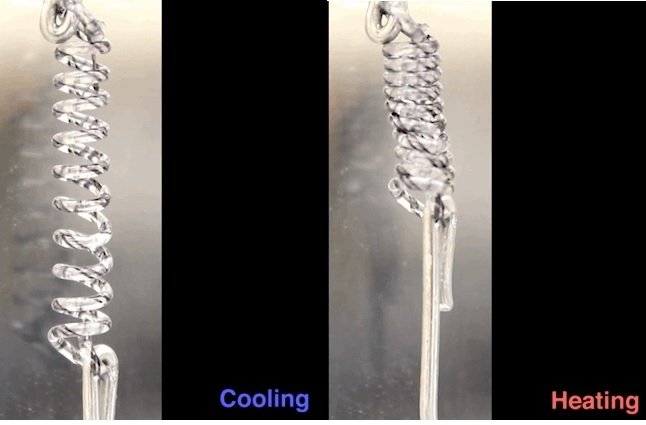 This is because when heated it wants to unspool, but when the muscle is supercoiled it won’t allow it to unspin, which is why it twists together and contracts. The goal was reached and the muscles did better than anticipated. The muscles could pick up to 9.5lbs and were very cheap and are also reliable. They seemed to work very well and they worked consistently. There were some challenges that were run into along the way, such as the muscle not returning to its original state, too much friction in the claw, how to heat the muscle, learning to code and wire Arduino, and making a system to make the muscles as consistently as possible. But all challenges were overcome to make the artificial muscle. So servos can cost anywhere from $5-$735 dollars for a servo that can do 2in/lbs-200in/lbs. of torque. This being said, if you were to use the artificial muscles that was made of 30lb or 50lb line, they can pick up to 9.5lbs. With 9.5lbs per muscle you can use 21 muscles to get 200lbs and instead of $735 for a servo it only would only cost $3.15, saving $731.85. If you used 100 muscles you could technically pick up 950 lbs. Current prosthetic limbs can cost around $100,000. With the artificial muscle you can make a prosthetic limb for around $160. This is because a single muscle only cost around $0.20 and can get millions of cycles out of it. The most expensive part to make the prosthetic limb would be the sensor to read your brainwaves which can cost around $100.